Are you ready for another easy pasta recipe that will seriously make you question if there was anything easier? 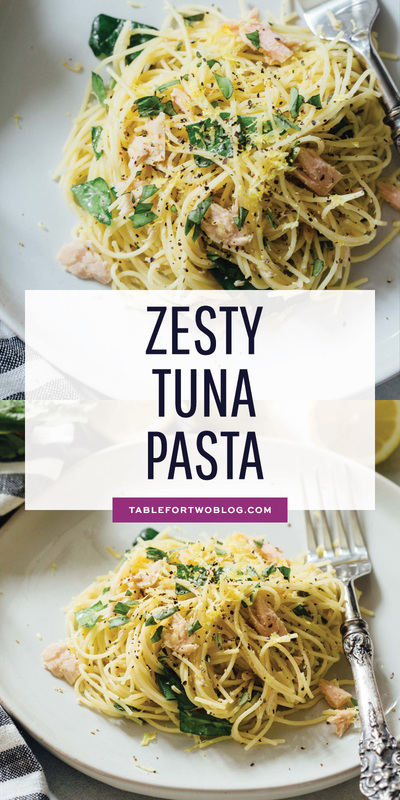 I introduce to you this zesty tuna pasta. My husband said he loved how even though it was light, it still had bold flavors and it was refreshing and bright. When I have bright and refreshing flavors in a dish, it evokes a sense of pleasurable eating because it makes me happy. 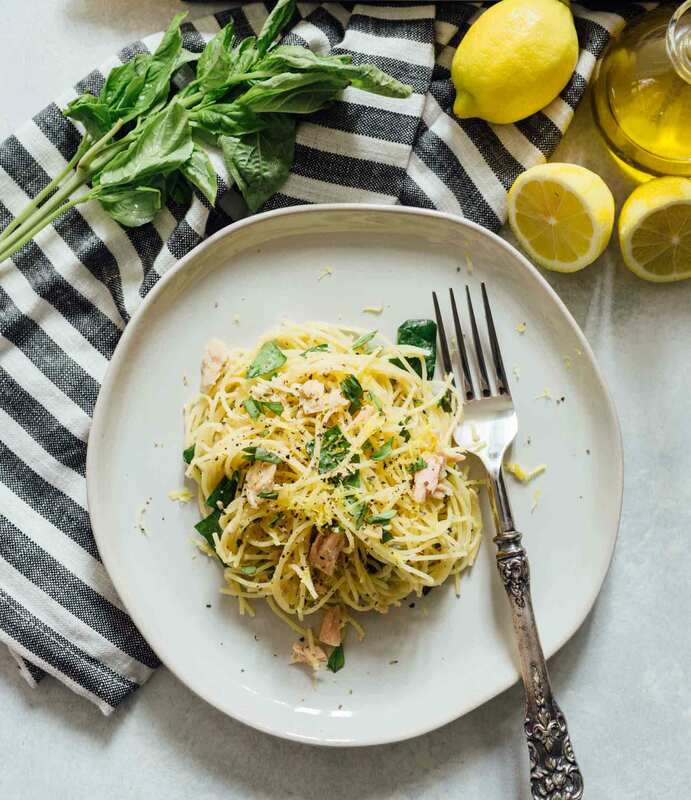 What are the ingredients used in this zesty tuna pasta recipe? 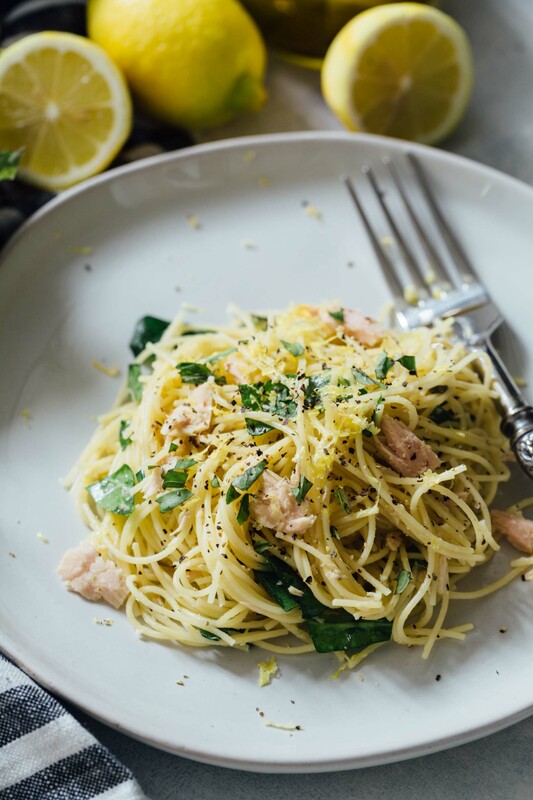 First and foremost, the star of the show, angel hair pasta. 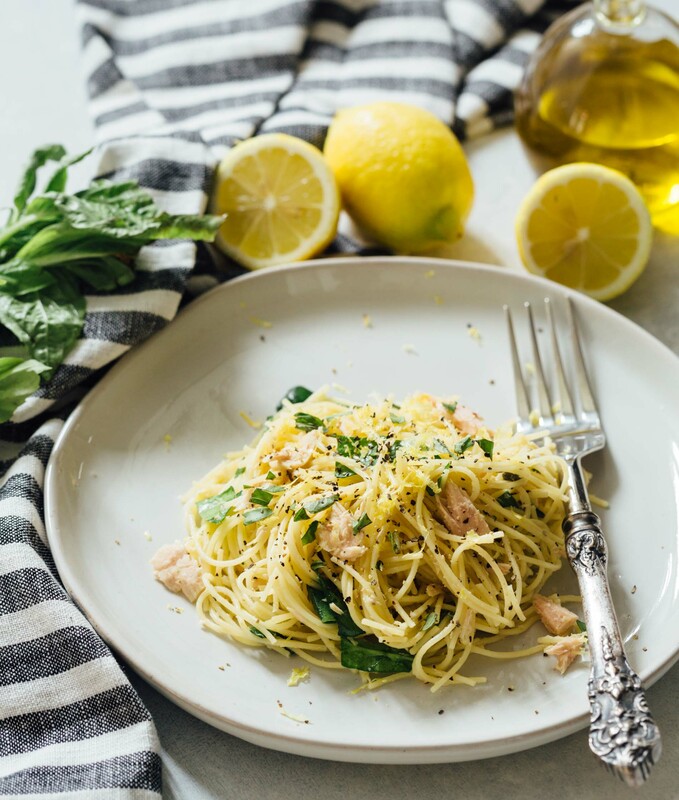 I chose to use angel hair pasta because of its delicate nature and how perfectly it paired with the rest of the ingredients. It also has the perfect al dente texture. 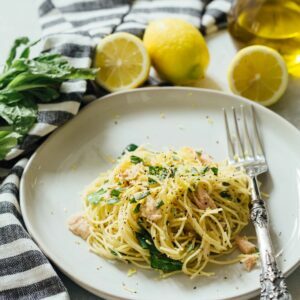 The angel hair pasta sort of helps elevate the rest of the flavors in the dish by being delicate. 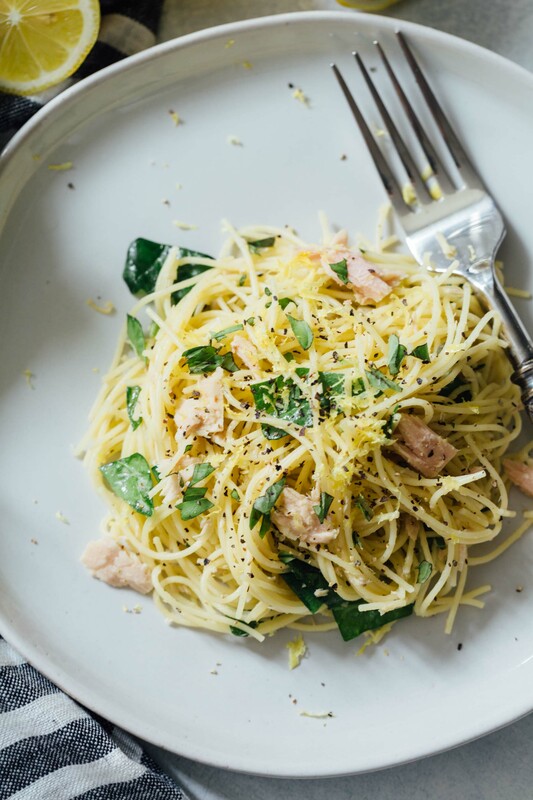 Can you use a different pasta other than angel hair? 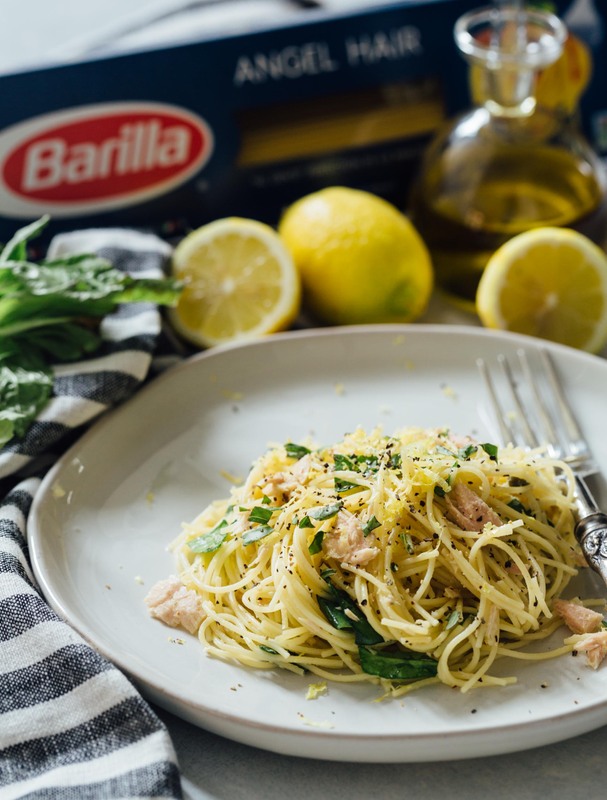 With this sauce pairing, because of the delicate extra virgin olive oil and lemon juice, I would suggest using a long pasta cut as opposed to a shorter shape. Spaghetti, linguine, or thin spaghetti are great options. What other greens would you suggest? Anything “baby” is good because it wilts easier. Baby spinach, baby arugula, baby kale, etc. What if I don’t like tuna? No problem! Lean meats and fish are part of the Mediterranean diet so you could easily swap out the tuna for something like chicken or shrimp! Do I have to use tuna packed in olive oil? It has the most flavor so I would highly recommend it. If you prefer to use tuna in water, I would drain it then add four tablespoons of olive oil to the dish. 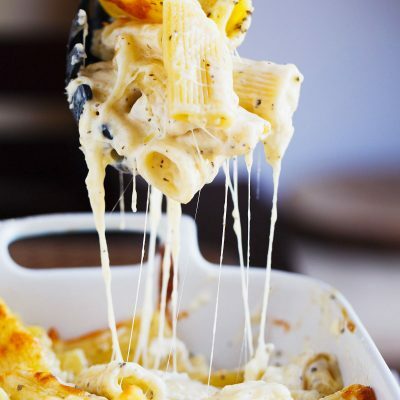 This light yet bold pasta is an easy pasta dish to whip up on any night of the week! Bring a pot of water to a boil and follow the directions on the pasta box and cook the pasta until al dente. In the meantime, in a large bowl, add the tuna with olive oil (see notes below), lemon juice, lemon zest, capers, and baby spinach. 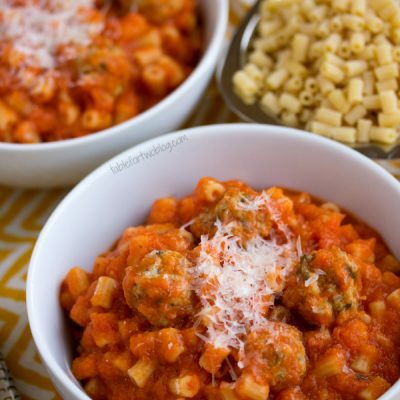 Once the pasta is done cooking, drain and immediately add to the contents of the large bowl. 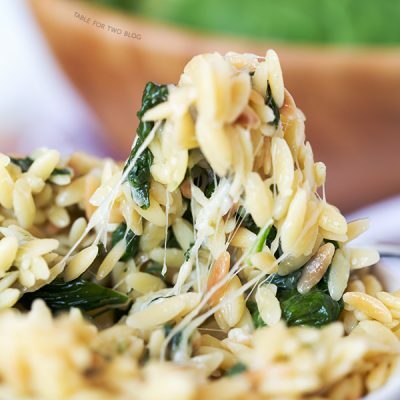 Toss the pasta and the ingredients together; the heat from the pasta will wilt the spinach and warm up the other ingredients. Season with salt and pepper, to taste. Divide evenly onto plates and serve. Garnish with basil leaves on top, if desired. *If you're using tuna packed in water, drain it and add it to the bowl along with four tablespoons of olive oil.